Background and objectives Persons receiving outpatient hemodialysis are at risk for bloodstream and vascular access infections. The Centers for Disease Control and Prevention conducts surveillance for these infections through the National Healthcare Safety Network. We summarize 2014 data submitted to National Healthcare Safety Network Dialysis Event Surveillance. Design, setting, participants, & measurements Dialysis facilities report three types of dialysis events (bloodstream infections; intravenous antimicrobial starts; and pus, redness, or increased swelling at the hemodialysis vascular access site). Denominator data consist of the number of hemodialysis outpatients treated at the facility during the first 2 working days of each month. We calculated dialysis event rates stratified by vascular access type (e.g., arteriovenous fistula, arteriovenous graft, or central venous catheter) and standardized infection ratios (comparing individual facility observed with predicted numbers of infections) for bloodstream infections. We described pathogens identified among bloodstream infections. Results A total of 6005 outpatient hemodialysis facilities reported dialysis event data for 2014 to the National Healthcare Safety Network. These facilities reported 160,971 dialysis events, including 29,516 bloodstream infections, 149,722 intravenous antimicrobial starts, and 38,310 pus, redness, or increased swelling at the hemodialysis vascular access site events; 22,576 (76.5%) bloodstream infections were considered vascular access related. Most bloodstream infections (63.0%) and access-related bloodstream infections (69.8%) occurred in patients with a central venous catheter. The rate of bloodstream infections per 100 patient-months was 0.64 (0.26 for arteriovenous fistula, 0.39 for arteriovenous graft, and 2.16 for central venous catheter). Other dialysis event rates were also highest among patients with a central venous catheter. 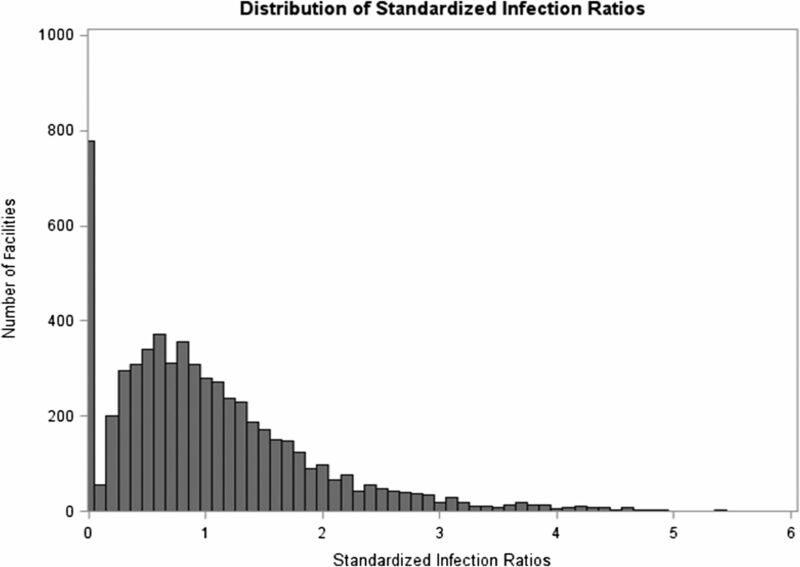 Facility bloodstream infection standardized infection ratio distribution was positively skewed with a median of 0.84. Staphylococcus aureus was the most commonly isolated bloodstream infection pathogen (30.6%), and 39.5% of S. aureus isolates tested were resistant to methicillin. Conclusions The 2014 National Healthcare Safety Network Dialysis Event data represent nearly all United States outpatient dialysis facilities. Rates of infection and other dialysis events were highest among patients with a central venous catheter compared with other vascular access types. Surveillance data can help define the epidemiology of important infections in this patient population. More than 420,000 patients receive hemodialysis at over 6400 outpatient dialysis centers in the United States (1). Patients on hemodialysis are at high risk for infection because of their impaired immune defenses and repeated access of the bloodstream through vascular access sites (2–4). Common hemodialysis vascular access types in order of increasing infection risk are arteriovenous fistulas (AVFs), arteriovenous grafts (AVGs), and central venous catheters (CVCs) (3,5–7). Infections in patients on hemodialysis increase mortality, hospitalization, health care costs, and need for antimicrobials (1,6,8). Frequent administration of antibiotics to patients on hemodialysis contributes to antimicrobial resistance and multidrug-resistant organisms (MDROs) (9,10). Tracking of infections and other adverse events among patients on hemodialysis is useful to facilitate quality improvement and monitoring of the effectiveness of infection prevention measures (11–13). The Centers for Disease Control and Prevention (CDC) has conducted surveillance for bloodstream infections (BSIs) and related events among patients on hemodialysis since 1999 (14), most recently through the National Healthcare Safety Network (NHSN) (6). Data reported to the NHSN have been used by the Centers for Medicare and Medicaid Services (CMS) as part of the ESRD Quality Incentive Program (QIP) since 2012. In 2014, clinic-specific BSI standardized infection ratios (SIRs) on the basis of NHSN data were used by the CMS to assess dialysis facility performance. In this report, we summarize 2014 data submitted to NHSN Dialysis Event Surveillance. The NHSN is an internet-based surveillance system that enables facilities to report health care–associated infection data to the CDC (15). 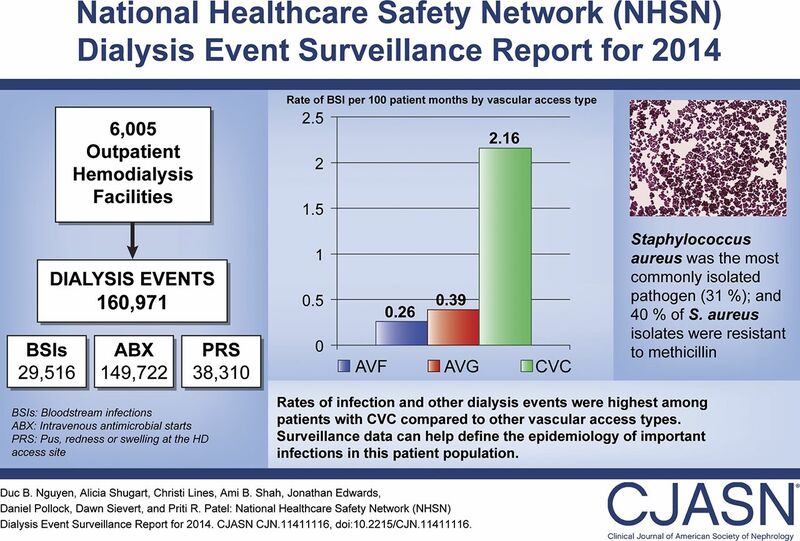 Vascular access infections in patients on dialysis and related events are reported to the NHSN’s Dialysis Event Surveillance. Outpatient hemodialysis facilities participating in the surveillance are instructed to follow a standard protocol (16) by which all outpatients who receive hemodialysis at the facility are monitored for three NHSN-defined dialysis events (see below). Facilities also report a point prevalence of their patient population to estimate the number of patient-months at risk. Completion of an Outpatient Dialysis Center Practices Survey is required annually. The three types of dialysis events (positive blood culture; intravenous antimicrobial start [ABX]; and pus, redness, or increased swelling [PRS] at the vascular access site) are reported using a standard data collection form (17). All types of vascular access that the patient has present at the time of the event or combination of events are reported. Facilities also report patient demographic data, associated clinical symptoms (e.g., fever, chills, and drop in BP), and select event-related outcomes (i.e., hospitalization and death). For each dialysis event type, facilities must either (1) have reported one or more events of that type during a given month or (2) confirm that no events of that type occurred during the month. A positive blood culture is reportable if the blood specimen was collected in the outpatient setting or within 1 calendar day after a hospital admission (i.e., on the day of or the day after admission to the hospital). There must be 21 or more days between positive blood cultures for both to be reported as separate events. For each positive blood culture, the suspected source is indicated as (1) vascular access, (2) another site, (3) contamination, or (4) uncertain. All reportable positive blood cultures are defined as BSIs, regardless of suspected source. For each BSI, up to three pathogens isolated from blood may be reported along with antimicrobial susceptibilities of each pathogen. Susceptibility to antibiotics is reported as susceptible, intermediate, resistant, or not tested (18). An intravenous ABX is any outpatient initiation of intravenous antibiotics or antifungal drugs in a patient who has not received antimicrobials in the previous 21 days. Vancomycin starts are a subset of intravenous ABXs. Intravenous ABXs can be continuations of inpatient antimicrobial treatment. Facilities also report when the patient has one or more symptoms of PRS at a vascular access site. There must be 21 or more days between the onset of one episode and the onset of a second episode for both to be reported as separate events. From the three main dialysis event types reported, other measures are also defined: (1) access-related bloodstream infection (ARBSI) is a BSI with the suspected source reported as the vascular access or uncertain, (2) local access site infection is PRS of the vascular access site when an ARBSI is not present, and (3) vascular access infection is either a local access site infection or an ARBSI. Each month using a standard form, participating facilities report the number of outpatients who received hemodialysis during the first 2 working days of the month stratified by the patient vascular access type (19). If the patient has multiple vascular accesses, only his/her vascular access type with the highest risk of infection is counted using the following risk scale: nontunneled CVC > tunneled CVC > other vascular access devices (e.g., catheter-graft hybrid) > AVG > AVF. Each dialysis facility participating in the NHSN completes an annual Practices Survey in NHSN that includes data on facility characteristics and practices (20). We summarized self-reported characteristics of participating dialysis facilities using data from the Practices Survey for 2014. The national pooled mean rate of each dialysis event type was calculated combining data from all reporting facilities. For each event type, the numerator was the total count of events, and the denominator was the total number of patient-months reported. Rates were expressed as events per 100 patient-months. Pooled mean rates were also calculated for each vascular access stratum in a similar manner; for this calculation, if a patient had more than one access type, the event was attributed to the highest risk access type using the risk scale mentioned above. Data cleaning resulted in the exclusion of a small number of events (0.1% of events reported) and recoding of the vascular access type for some events. For example, duplicate events that should have been prevented by business rules in the NHSN application were removed. Monthly denominators that had a corresponding unconfirmed zero numerator were excluded. In addition to pooled mean rates, the 10th, 25th, 50th, 75th, and 90th percentiles were calculated using the distribution of rates from all individual facilities. To evaluate the relationship between infection events and antibiotic use, the correlation between the rate of either BSI or PRS and the rate of ABX was calculated using a Pearson correlation coefficient. An SIR was calculated for BSI. BSI SIR is a ratio of the number of BSIs that were observed at a facility to the number of BSIs predicted for that facility on the basis of national aggregate data across several vascular access type strata (21). For 2014, the number of predicted BSIs was calculated by multiplying the 2014 national aggregate BSI pooled mean rates stratified by vascular access type by the facility’s number of patient-months for each vascular access category and then summing these products. For rate and SIR calculation, tunneled and nontunneled CVCs were combined into one stratum, making four access type strata: AVF, AVG, other vascular access devices, and CVC. We included all pathogens reported for each BSI, calculated the frequency of each, and reported the most common pathogens isolated by event type (BSI or ARBSI). Because up to three pathogens can be reported per BSI, the total number of pathogens was greater than the number of BSIs. We also summarized the frequency of select antimicrobial-resistant pathogens using standard NHSN definitions of resistance patterns (18). These were methicillin-resistant Staphylococcus aureus (MRSA), vancomycin-resistant Enterococcus spp., Escherichia coli resistant to third generation cephalosporins, Klebsiella spp. resistant to cephalosporins, and Enterobacter spp. resistant to carbapenems. Percentage antimicrobial resistance was calculated among pathogens with available susceptibility results only (i.e., excluded isolates not tested for susceptibility). Data were analyzed using SAS 9.3 (SAS Institute, Cary, NC) and OpenEpi (22). For 2014, 6005 outpatient hemodialysis facilities reported at least 1 month of dialysis event data to the NHSN; 5682 (95%) facilities reported 12 months of data. The majority of participating facilities were freestanding (90%) and belonged to for-profit organizations (86%); 90% were part of a dialysis chain (Table 1). The median number of patients treated at the facilities was 59 (interquartile range, 34–90). A total of 160,971 dialysis events were reported to the NHSN for 2014, including 29,516 (18.3%) BSIs, 149,722 (93.0%) ABX, and 38,310 (23.8%) PRS (Table 2). Of patients who had events in 2014, most patients (75.5%) had only one event, 12.5% of patients had two or more BSIs, and <1% had four or more events. Among BSIs, 22,576 (76.5%) were ARBSIs; 63.0% of BSIs and 69.8% of ARBSIs occurred in patients with a CVC. Among local access site infections, 61.2% were in patients with CVC and 26.6% in patients with AVF (Supplemental Table 1). Of 29,516 BSI events, 45.9% occurred in patients who were noted to have fever, 34.4% occurred in patients with chills, and 3.5% occurred with drop in BP. Among ABX, 113,284 (75.7%) involved vancomycin use. The 55,615 vascular access infections included 33,039 (59.4%) local access site infections and 22,576 (40.6%) ARBSIs. A total of 4,579,021 patient-months were reported by facilities. The patient-month distribution by vascular access type was 62.8% AVF, 18.8% CVC, 11.8% AVG, and 6.6% other vascular access devices. Pooled rates of dialysis events and their percentiles are presented in Table 2 and Supplemental Table 1. Across event types, pooled rates were highest for CVC followed by other access device, and AVG, and they were lowest for AVF. The BSI rate ratio between CVC and AVF BSI rates was 8.2 (95% confidence interval, 8.0 to 8.4). A positive correlation (Pearson correlation coefficient =0.58; P<0.001) was found between the rate of infections that were either BSI or PRS and the rate of ABX. Hospitalization was an outcome for 35,286 (21.9%) of all dialysis events, including 17,392 (49.3%) among CVC events, 12,556 (35.6%) among AVF events, 5199 (14.7%) among AVG events, and 144 (0.4%) among other vascular access events. Hospitalizations occurred for 48.0% of BSIs, 46.1% of ARBSIs, 25.1% of vascular access infections, and 10.8% of local access site infections. Death occurred in 1352 (0.8%) of all dialysis events; 2.0% of BSIs and 1.6% of ARBSIs resulted in deaths. The national aggregate pooled mean BSI rate per 100 patient-months was 0.26 for AVF, 0.39 for AVG, 0.51 for other vascular access device, and 2.16 for CVC (Table 2). Using these national rates to determine the predicted number of infections for each facility, the BSI SIR for each facility was calculated (Figure 1). A total of 779 facilities (13%) had an SIR of zero (i.e., no BSI was reported for 2014). The median denominator for this subset of facilities was 279 patient-months (range =1–2611). This BSI SIR analysis included facilities that reported <12 months. Thus, Figure 1 does not equal the SIR distribution of data used in the ESRD QIP. Distribution of bloodstream infection standardized infection ratios among facilities reporting to Dialysis Event Surveillance, National Healthcare Safety Network, 2014 (n=6005). Among 29,516 BSIs, 32,016 isolates were reported; 24,574 isolates were reported for ARBSIs (Table 3). A total of 1383 (4.3%) BSI isolates were suspected to be contaminants. The most common BSI and ARBSI organisms were S. aureus followed by Staphylococcus epidermidis and other coagulase-negative Staphylococci (Table 3). Gram-negative organisms, such as E. coli, Enterobacter cloacae, Klebsiella pneumoniae, Pseudomonas aeruginosa, and Serratia marcescens, collectively accounted for 12.5% and 12.1% of BSI and ARBSI isolates, respectively. Other pathogens that might point to a water source of infection (i.e., Proteus mirabilis, Stenotrophomonas maltophilia, Bukholderia cepacia, Ralstonia picketti, and Candida parapsilosis) collectively accounted for 2.4% of BSIs. Among pathogens with susceptibility testing, 39.5% of S. aureus were methicillin resistant, and 59.3% of those resistant S. aureus were from patients with CVC. Other important drug-resistant pathogens included E. coli resistant to cephalosporins (17.8%), Klebsiella spp. resistant to cephalosporins (14.6%), Enterococcus resistant to vancomycin (11.4%), and Enterobacter spp. resistant to carbapenems (4.8%). However, antimicrobial susceptibility results were not available for all identified pathogens. For example, testing results to determine methicillin susceptibility were unavailable for 17.8% of S. aureus isolates (Table 4). This report summarizes BSIs and other dialysis event data submitted to the NHSN by the vast majority of dialysis facilities nationwide (1). Similar to other studies (3,5) and previous NHSN reports (6,7,23), our findings show that rates of BSIs and other related events in 2014 were higher in patients on hemodialysis who had a CVC compared with other vascular access types. The proportion of patients who were hospitalized as a result of an event was also higher among patients with a CVC compared with patients with an AVF or an AVG. Catheters are a portal of entry for infection and might be used in patients with higher acuity of illness. In the NHSN, 63% of BSIs and 69% of ARBSIs occurred among patients with a CVC, whereas CVCs represented only 19% of all patient-months reported. Given the high rate of infections among patients with a CVC, continued efforts to limit CVC use are needed. The overall and CVC-specific rates of BSI and ARBSI in this report were lower than the corresponding rates from previous CDC surveillance reports, despite the use of similar protocols and definitions (6,7,23). For example, pooled mean BSI and ARBSI rates per 100 CVC patient-months were 2.16 and 1.83, respectively, in 2014 compared with 3.21 and 2.52, respectively, in 2007–2011 and 4.2 and 3.1, respectively, in 2006 (6,23). The total number of estimated central line–associated BSIs (or ARBSIs in patients with a CVC) reported for 2014 (15,753) is also substantially less than the central line–associated BSI estimate of 37,000 (estimated range of 23,000–57,000) generated from 2008 NHSN data (24). Potential reasons for the differences in rates and burden estimates include (1) successes in widespread BSI prevention efforts conducted by dialysis provider organizations, ESRD Networks, and others (25,26); (2) potential under-reporting of BSIs (shown in several studies) (27–29); and (3) pre-2014 surveillance data derived from a smaller number of potentially nonrepresentative dialysis facilities. Similar to previous NHSN reports (6,7,23), S. aureus was the most common pathogen identified among BSIs. S. epidermidis and other coagulase-negative Staphylococci were also common but at lower proportions. Among S. aureus isolates, 40% were MRSA, which continues to be a major problem, although the rate of invasive MRSA infections in patients on dialysis has been declining (30). Other MDROs were also reported, highlighting the need for monitoring these organisms to prevent and control the spread of resistance (31). In this report, intravenous ABXs were common and accounted for the vast majority of dialysis events. High frequency of antibiotic use in patients on hemodialysis has been documented previously (10,32). Rates of intravenous ABXs were remarkably similar between this report and earlier studies (23). If infection prevention efforts have resulted in lowered BSI rates, then these efforts do not seem to have produced a concomitant decrease in antimicrobial use. Separate initiatives may be needed to improve antimicrobial prescribing patterns for patients on dialysis. Vancomycin is widely used in dialysis facilities (76% of intravenous antimicrobial initiations in this report), and anecdotal evidence suggests that some facilities might not have a standard policy to obtain blood cultures before intravenous antibiotic use. This could lead to underdetection of BSIs and overuse of antibiotics and could contribute to the acquisition of MDRO colonization or infection among patients on dialysis. We examined a combined infection rate (i.e., rate of BSI or PRS) together with intravenous ABX rates to assess whether reported antimicrobial use was largely explained by reported infections and found that these rates were positively correlated. However, the correlation was moderate (coefficient of 0.58). This might represent variations in antibiotic prescribing, blood culturing practices, or reporting of dialysis events, all of which can be potential areas for improvement (33,34). The 2014 BSI SIR distribution was skewed; 13% of facilities had an SIR of zero, whereas some facilities had a very high SIR. The median SIR was 0.84, suggesting that the majority of facilities had a lower BSI than the national average. Differences in infection rates and SIRs may reflect the intrinsic risks of the patient population or use of infection control measures at participating facilities. Under-reporting may also be a contributing factor (27–29). The CDC recommends routine use of NHSN surveillance data to target areas for infection prevention, and successful use of data for BSI prevention has been reported (25,26,35,36). The surveillance system allows hemodialysis facilities to enter infection data, calculate rates, visualize the rates of important events over time, and compare with their own rates from previous time periods or benchmark against national rates. There are several reports and analytic features in the NHSN to help users identify key areas for intervention and track whether the interventions work. Because almost all outpatient hemodialysis facilities report to the NHSN, the effect of infection prevention initiatives at various levels (individual facilities and regional or national levels) can be measured through the system. Despite the near-universal scope of reporting to the NHSN, there are limitations to this surveillance. Almost all (95%) facilities reported data for 12 months of 2014, but data quality remains a foremost concern. Infection surveillance through the NHSN is relatively new for most outpatient hemodialysis facilities. It may take additional time for facility staff to fully understand the protocol. Under-reporting of BSI events has been identified through different data validation efforts (27,28,37). A key issue leading to under-reporting of BSI data is that reportable positive blood cultures obtained on hospitalization are often not communicated back to dialysis facilities (28). Therefore, some facilities that reported no BSI may actually have positive blood cultures unknown to them. This emphasizes the need to strengthen communication between dialysis facilities and hospitals. Moreover, it has been suggested that public reporting programs could discourage accurate reporting of health care–associated infection data (38). Efforts by ESRD Networks and the CDC are underway to increase communication between hospitals and dialysis facilities, perform data checks, and improve data quality and completeness. The CDC also provides multiple training courses on the NHSN to dialysis staff to improve surveillance practices and adherence to the reporting protocol. Some susceptibility testing and reporting remains suboptimal; this limits the ability to accurately determine the proportion of infections caused by antimicrobial-resistant organisms. For example, the gap in S. aureus susceptibility testing likely represents a reporting error and is an opportunity for improvement. In conclusion, this report presents NHSN surveillance system data for 2014, the first year of data used by the CMS to assess facility performance on the QIP BSI measure. Although a minority of patients seemed to have dialyzed with a CVC, the infection rates and burden were higher among this group than patients with other vascular access types. Although important opportunities exist for data quality improvement, we believe that the data are nationally representative. Local and regional efforts to reduce infections among this vulnerable patient population should incorporate this established system of measurement. We thank Kelly Peterson, Jerome Tokars, Alexander Kallen, Gary Stein, the National Healthcare Safety Network (NHSN) team, and NHSN Participants in Dialysis Event Surveillance. The findings and conclusions in this manuscript are those of the authors and do not necessarily represent the official position of Centers for Disease Control and Prevention. See related editorial, “Infection Monitoring in Dialysis Units: A Plea for “Cleaner” Data,” on pages 1038–1039. This article contains supplemental material online at http://cjasn.asnjournals.org/lookup/suppl/doi:10.2215/CJN.11411116/-/DCSupplemental.